The other day I was returning an ill-fitting pair of hiking boots at REI. I pointed out to the cashier that she had refunded too much money: I had bought the boots at a 15% discount but was refunded the whole amount. She thanked me for my honesty and I explained (not entirely ironically), that my soul was worth more than $18. Sometimes, though, honesty can be more than spiritually rewarding. For ten years, starting with my college days at UC Berkeley, I studied the martial arts Hapkido, Tae Kwon Do, and Judo. Every year a bunch of us drove from California to a martial arts camp in Montana. One year we stopped for gas and, when we were on the road again, realized that each of us thought someone else had paid for gas, and no one had. It was too late to go back. So, it does pay to be honest. 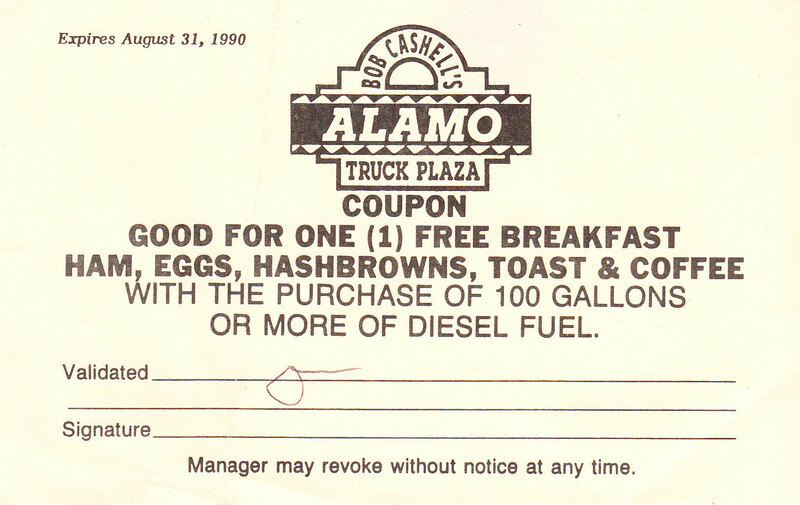 And one day I may use that coupon… for one free breakfast with the purchase of 100 gallons of diesel fuel! This entry was posted on Friday, August 24th, 2007 at 5:30 pm	and is filed under Miscellany, Musings. You can follow any responses to this entry through the RSS 2.0 feed. You can leave a response, or trackback from your own site.